We routinely offer free web seminars to educate others on the principles and techniques for growing innovation in their organizations. This seminar enables leaders and managers to stimulate and grow innovation as an organizational initiative. We will discuss the challenges and opportunities of establishing an innovation culture, models for incubating ideas, and a process for seeing those ideas through to commercial success. 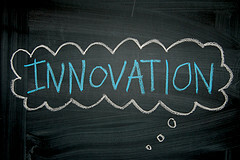 Attendees will leave better equipped to establish and sustain innovation initiatives in their organization.